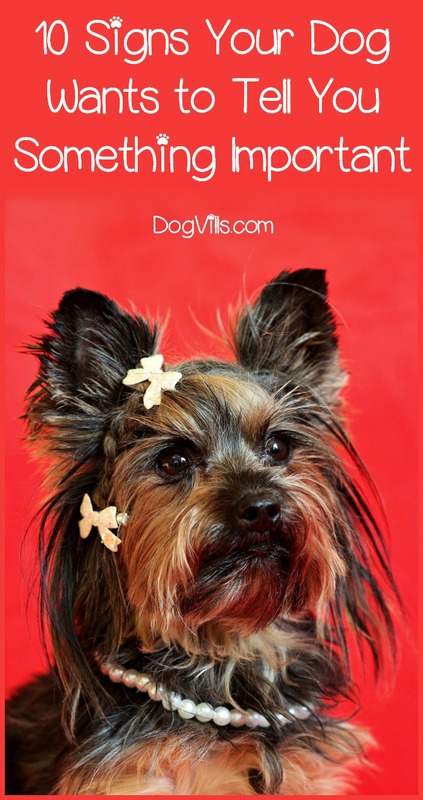 Are you puzzled by your dog’s behavior? Are you wondering if he is trying to tell you something? Well, it’s your lucky day. Keep on reading to find 10 signs that your dog wants to tell you something important. Sometimes it’s difficult to understand our four-legged companion. You approach Buddy thinking he wants cuddles, only for him to turn around and run away from you. Does it sound familiar? It’s not hard to misinterpret our dog’s behavior, mainly because we compare them to humans. Unfortunately, dogs can’t speak and tell us what they want or need. That’s why we have to monitor their body language closely to figure out what’s going on. Here are ten signs your dog wants to tell you something important, and you’d better listen to him. While almost all dogs bark, you shouldn’t ignore excessive barking. It might be a cry for help. For example, if Buddy starts barking, howling, whining, or yelping, he might be saying “I’m hurt, I’m in pain.” That’s especially true for dogs, which are usually as quiet as a mouse. Dogs that have too much excess energy will turn any house into a mess. So, destructiveness is a sign that you should spend more time with your pet and provide interactive toys. You might also get Buddy a play friend. So be sure to show your dog that you appreciate his gift or you might insult him. Give him a scratch behind the ear or a delicious treat. You’ve probably heard that you shouldn’t keep direct eye contact with a dog. Well, that’s not always true. When your pet keeps staring into your eyes, he is saying “I love you. I trust you. I know that you won’t harm me.” It’s the ultimate sign that you’re doing a good job and that Buddy is happy. Moreover, studies have proven that prolonged eye contact between a human and his dog releases a bonding hormone called oxytocin. So, don’t be afraid to look your dog in the eye. Yes, when Buddy is yawning he might be sleepy. But yawning also says “I’m nervous,” or “I’m anxious.” So, when you’re outside or you have friends over, and you see Buddy yawning a lot, this is a sign that something is bothering him. In such cases, you should remove him from the situation. But if you are yawning and you see that Buddy is doing the same, this is not a reaction to stress. It’s called contagious yawning, and it’s a sign that your dog is in sync with you. A dog which flicks its tongue and licks its nose is trying to say “I’m not comfortable.”, “Something is bothering me.” If you notice this behavior around unfamiliar people or children, it’s for the best to give the dog some space. Often when you look into your dog’s eye, you can judge his emotions pretty well. Wide open eyes speak clearly “I’m afraid,” while round eyes say “I’m surprised.” But if you can see the white of Buddy’s eyes, that’s a warning. It says “I’ve had enough,” or “I’m ready to bite.” Don’t ignore this sign or you’ll end up in trouble. Does your dog love to sit on your feet? Congratulations! He is saying “This is my human” and marking you as his territory. He is also telling you “I’m feeling safe and secure with you.” You should cherish such moments and show your dog how much he means to you. It’s normal for dogs to groom themselves, but too much grooming is a worrying sign. If the licking is concentrated on a certain spot, your dog might be trying to tell you “It hurts here, help me.” Obsessive licking might also be a sign that you’re not paying enough attention to your dog and he feels stressed and lonely. In this case, he is finding comfort in licking himself. Although dogs can’t speak verbally, they have their own way to show us love, friendship, discomfort, and fear. You just have to be a very good listener. Trust your instinct and remember that a dog that suddenly changes his behavior might be in need of medical attention. What do you think about these ten signs your dog wants to tell you something important? How does your dog speak to you? Share your story in the comments.